Inverell Shire Council Deputy Mayor Anthony Michael, left, Officer in Charge of Inverell Police Station Chief Inspector Rowan O’Brien, Northern Tablelands MP Adam Marshall, Mayor Paul Harmon and New England Police District Commander Superintendent Scott Tanner looking over the concept designs for the new 24-hour Inverell Police Station. THE Inverell community is now a step closer to having its new 24-hour police station, with Northern Tablelands MP Adam Marshall today unveiling the concept designs for the historic project. Mr Marshall was joined by Mayor Paul Harmon, Deputy Mayor Anthony Michael, New England Police District Commander, Superintendent Scott Tanner and Inverell Officer in Charge, Chief Inspector Rowan O’Brien, for the announcement. Mr Marshall said detailed planning for the new state-of-the-art $9 million police station was progressing well, with close discussions alongside stakeholders, including local police, taking place. “Today is an exciting milestone in now being able to view the artist’s impression and preliminary designs for the new station, as consultation with local police continues,” Mr Marshall said. “This is a first glimpse of what the new police station may look like –it looks good so far – and after a three year campaign to secure the funding I’m elated for Inverell that we’re seeing progress on the project. “We want to make sure this project acknowledges the amenity of the local area but, most importantly, meets the needs of the local police and community now and into the future – which is why ongoing consultation is so important, to ensure we get it right. Mr Marshall said the current station was built when Inverell had only 12 police, and that number has now grown to around 50 officers. 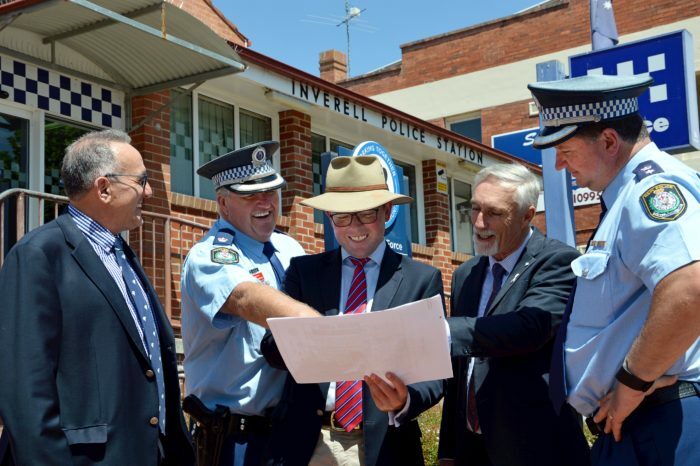 “Once built, this new 24-hour station will provide Inverell Police with modern facilities and the equipment they need to prevent and disrupt crime and keep the community safe,” Mr Marshall said. “Importantly, it will be built with an eye to the future to cater for a growing local police force, as the community continues to expand. “I’m also pushing for provision within the new station for a Police Dog Squad, as this will be an essential resource for officer across the entire New England District, based out of Inverell. Mr Marshall said the detailed designs would be finalised with local police over the coming months with the project expected to go out to tender in April next year.